Mixwater Mill is a remote mill on the White River. 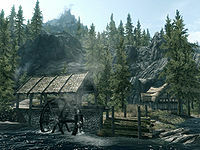 Located southwest of Windhelm and southeast of Gallows Rock, on the banks of White River. Gilfre has lived here alone since her five workers left to fight in the civil war. Along with the sawmill itself is Gilfre's House and the now empty Worker's House. Inside Gilfre's House is a copy of the Archery skill book The Marksmanship Lesson and various other items--(for full details please see the individual page). Any of the items inside the Worker's House can be taken without being considered theft--(for full details please see the individual page). The wood chopping block is next to the sawmill and cooking pot is in front of the fireplace inside Gilfre's house. The mill can make an excellent free home for an early game character if they marry Gilfre. However, the drying salmon and containers outside Gilfre's House do not become player-owned, even after marriage, and will be considered stealing. You can also use the worker's house to sleep in for free. You can buy sawn logsHF here after installing Hearthfire by speaking to Gilfre. You can also cut your own for free if she has given permission to do so or you have married her. This page was last modified on 18 December 2018, at 21:19.